After spending a lifetime saving for retirement, you might think (or hope) the tough financial work is over. But in reality, retirement will bring several new financial challenges. Here are three of the key questions you'll need to address along with some recommendations. 1. When should I take Social Security? This is when you first become eligible to receive Social Security benefits. If you opt to take them this early, you'll get the smallest monthly benefit. While it's true that you may end up collecting benefits for the longest period of time by starting at age 62, if you can afford to do so, it's generally best to wait at least until your full retirement age (FRA). At that point, your monthly benefit will increase by 30 percent. If you're planning to continue working to some degree in your early to mid 60s, this may be another reason to wait. Claiming Social Security benefits before your FRA will trigger an "earnings test." After you earn a certain amount (about $17,000 in 2017), for every two dollars of income, your Social Security benefits will be reduced by one dollar. You can learn more about the earnings test on the Social Security Administration's website. If you were born in 1960 or later, your full retirement age is 67. That's the age at which you become eligible to receive what the Social Security Administration deems to be your "full" benefit. An important consideration related to your FRA has to do with spousal benefits. If you earned significantly more than your spouse over your careers, his or her spousal benefit (half your full retirement age benefit) may be larger than his or her own benefit. While your spouse could file for spousal benefits as early as age 62, he or she will get the maximum amount only if you both wait until your full retirement ages before claiming benefits. While it may sound as if full retirement age is when you'll qualify for your maximum benefit, waiting until age 70 will actually give you more. When I checked my benefits on the Social Security Administration website, I found that waiting until age 70 would boost my monthly benefit amount by nearly 28 percent versus claiming it at my FRA of 67. 2. How much of my nest egg can I withdraw? A long-standing rule of thumb is that you can safely withdraw 4 percent of your nest egg each year, bumping that amount up by the rate of inflation each year, without having to worry about depleting your savings before you die. However, there are many moving parts to this equation. Your cost of living will probably vary throughout retirement, and so will the stock market's performance. So, instead of adhering to a fixed formula, rerun the numbers each year using what some planners call a dynamic withdrawal strategy: Determine how much to withdraw based on the performance of your portfolio and your spending needs. 3. Which nest egg funds should I tap first? If you have money in various accounts, such as a taxable account, a tax-deferred account (traditional IRA/401(k)), and a tax-free account (Roth IRA/401(k)), here's a recommended path for greatest tax efficiency. Generally, it's best to use money in your taxable accounts first, which allows funds in tax-advantaged accounts to continue growing on a tax-deferred or tax-free basis. Next, use money from your traditional IRA or 401(k) accounts. In fact, you have to start taking money from these accounts beginning at age 70½. That's when required minimum distribution (RMD) rules kick in. If you don't withdraw at least a specific minimum amount, you'll owe stiff penalties to the IRS. One factor to keep in mind is that if you have substantial balances in traditional IRA or 401(k) accounts, waiting to tap any of this money until age 70½ may make your RMDs so large that they'll push you into a higher tax bracket. If that's the case, you may want to start taking some withdrawals from these accounts earlier than age 70½. It's usually best to save your Roth IRA money for last since they are not subject to RMD rules. If you don't need the money, you can let it continue growing tax-free. While retirement may be a time when you want to step away from some of the many responsibilities you had during your working years, it's important that you stay proactive with regard to your finances. 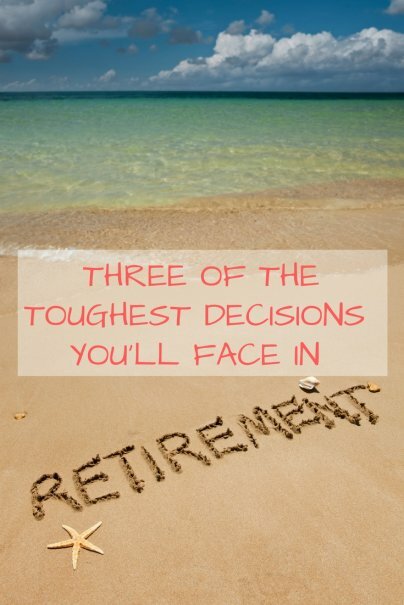 Making well thought out decisions in the three areas discussed above will go a long way toward helping you enjoy financial peace of mind in your later years.